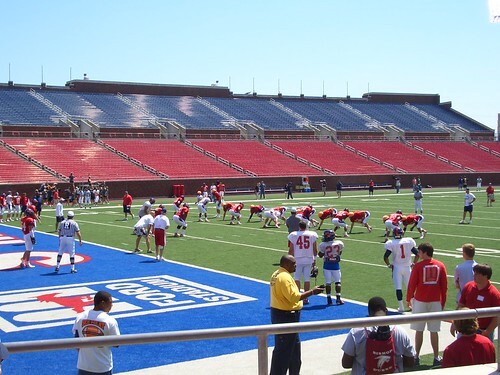 Last week I was lucky to be in Dallas for the SMU Mustangs Red and Blue scrimmage on the 5th. Later on Jeff Reinebold was kind enough to spend some time with me running through some of the history and key concepts of the Run & Shoot offense. It was a fantastic experience and there is a great energy and excitement at SMU as they start their rebuilding program under June Jones. Many thanks to Matthew for letting me travel out a couple of days early for LinuxFoundation summit which gave me time to attend the scrimmage, and also the Jeff and and the other SMU staff who where so generous in sharing their time and knowledge with me.